Flight Engineers Dan Burbank, Anton Shkaplerov and Anatoly Ivanishin joined their Expedition 29 crewmates when the hatches between the Soyuz TMA-22 spacecraft and the International Space Station were opened at 2:39 a.m. EST Wednesday. The Russian Soyuz capsule docked with the International Space Station at 12:24 a.m. EST. 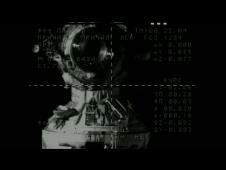 The hatches were officially opened between Soyuz and the International Space Station at 2:39 a.m. EST.